During the last few weeks of my internship at the farm we spent the majority of our time in the Walbridge Woods. While working on the approximately 15 acre forest, we constantly heard birds calling, saw chipmunks playing and were fully aware that the mosquitoes were alive and well. We even saw a painted turtle scoot across the trail the other day. The Walbridge Woods has been the heart of our timber stand improvement over the course of the latter part of the summer. 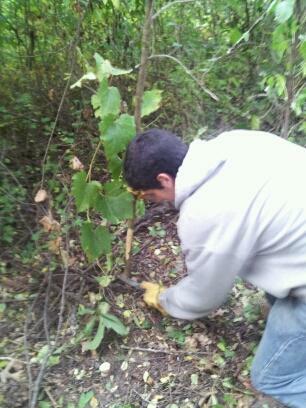 We have been removing Buckthorn, Honeysuckle, Wild Grape, and other invasive species. The other day while I was removing some Buckthorn, I noticed this tiny Spruce trying to survive under the pressures of the all the other plants around it. It was then I realized how much the future of the stand really is in our hands. There are many different types of management plans and many ways to go about implementing them. We could choose to do nothing with the stand and let it progress naturally, we could bring in goats to graze the understory, or clear cut it just to name a few. I'm not positive what the final plan is for the Walbridge Woods, but for now we are removing the invasives in the understory and allowing the sun to penetrate more of the forest floor to allow seedlings and saplings to persists. As for now this will be the last of my posts. I had a wonderful intership here on the farm; I worked hard, learned a lot and had a lot of fun while doing it. Thank you for following along with summer adventures! 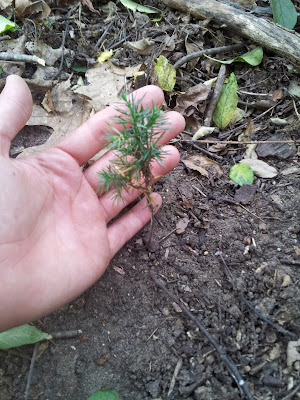 I hope to come back to this stand some day and see this tiny Spruce growing tall and strong. You are doing an amazing job mate. 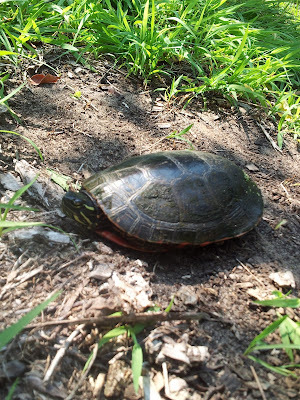 And that turtle looks really healthy haha. Keep it up. And keep us updated on your blog please.